If you are searching for a new Static Caravan Holiday Home with a higher standard of specifications, luxury features and stylish, modern interiors then look no further than the Europa Mulberry Static Caravan. North Wales Caravans are here to help you with your choice, and with our extensive knowledge of the market can answer any questions you have regarding your purchase, including the availability of possible help with funding your new purchase if required. The Mulberry model from the Europa Range will sleep up to six in various size options available, with two bedroom options in 32, 36 and 38 feet wide models, and three bedrooms in 36 and 38 feet widths. The bedrooms are furnished with quality soft furnishings together with leather headboards. The master bedroom offers a touch of luxury with a walk-in wardrobe, overhead storage cupboards with bedside lights, a dressing table with mirror and glass shelving, gloss doors throughout and a king size divan bed. You will also find a connection for your TV hidden away in the wardrobe unit. Offering an en-suite and a luxuriously fitted bathroom with shower cubicle, there are plenty of storage cupboards for your toiletry essentials. The lounge and dining areas are inviting, stylish and offer modern soft furnishings in both leather and fabric, panoramic views from all areas of the lounge, with an option to have outlook doors installed for easy access to outside space. Additional ceiling height is given with the vaulted ceilings creating a feeling of space in the living area. Here you will find contemporary, fitted furniture for your television and audio equipment, plus an electric flame-effect fire with a modern surround, which creates an impressive central feature. A coffee table provides that additional space for your books and magazines whilst relaxing on the sofas. The kitchen in the Europa Mulberry Static Caravan is quite spacious, with doors in a contemporary, gloss finish and feature handles, hardwood effect floor covering in an easy to clean vinyl and several luxury appliances. An integrated oven, grill and hob with a glass lid, a stainless steel chimney cooker hood, along with a full-size fridge freezer (also integrated), all of which ensure that the kitchen feels quite luxurious. A free standing dining table and four chairs complement the wood effect furniture in the lounge to provide a family eating and entertaining space. Central heating is included as a standard feature and coupled with the underfloor insulation you will be warm and cosy in your new holiday home, whatever the weather outside. All this, combined with its striking external appearance, which incidentally is also available in the environmental shade of green, makes the Europa Mulberry Static Caravan a really stunning Holiday Home. 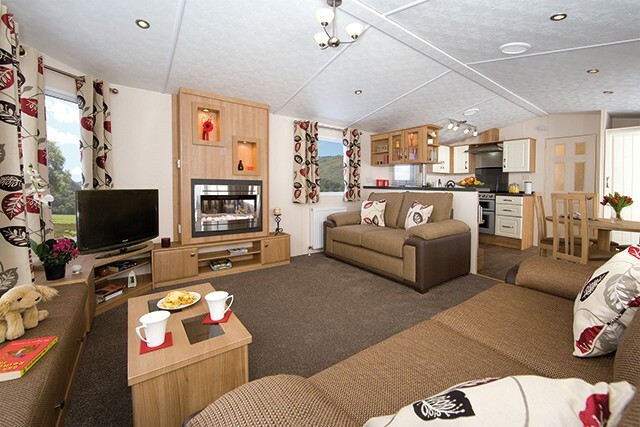 Click here to see what’s available in our stock of Mulberry Static caravans for sale.